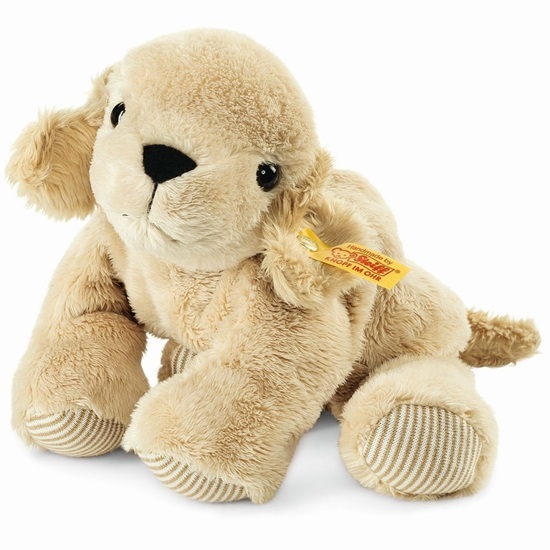 The perfect companion for anyone, young or old, meet "Lumpi" a soft, cuddly plush puppy dog from Steiff's Floppies Series. "Lumpi" is made from the softest, velvety beige plush. His paw pads are sewn from a beige and white striped fabric. He is filled with synthetic filling material with a touch of beans for hours of cuddling. "Lumpi" is 8-inches tall and machine washable. The "Floppies Series" is a collection of loosely stuffed, ultra lovable animals with a touch of beans inside. Each is made out of the most huggable materials available. All are designed for hours of creative play for the littlest Steiff fans. To know them is to love them. These cute, little floppies by Steiff are made of cuddly soft plush and are guaranteed to put a joyful spark in children's eyes for many years. These charming playmates are now even fluffier than before. And when you hold one of these soft, cuddly friends in your hands, you may not want to let go again. All floppies have the original Steiff yellow tag in their ear. All floppies, and mini floppies, are machine washable.